When telling the life story of a certain individual on the big screen, both the person and their tale need to have some form of cinematic presence in order to translate well into a narrative feature. If they’re fascinating enough to warrant almost two hours of film, then it’s justified. 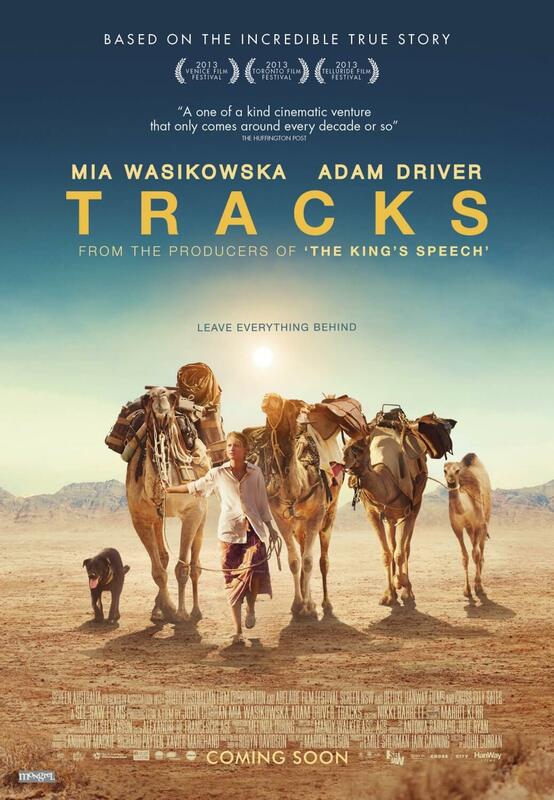 The subject matter of Tracks, in all fairness, isn’t a bad one; it’s an interesting story of a dangerous journey with a central figure who can be explored in great detail. You’d think that this would make a damn good film. And you’d be right… if it were a documentary. As a narrative film, Tracks seriously struggles to find its footing and ends up wandering about as aimlessly as the main character does. The biggest reason for this is because, honestly, it’s not that compelling a story. A young woman travels across the Australian outback toward the Indian Ocean… and that’s it. There’s no dramatic hook or emotional engagement, it’s just this person going on walkabout with hardly anyone for company and not much else. As a result, the film quickly becomes a very dull experience with padded-out scenes and lesser conflicts – the film suddenly shifts focus at one point so she can find her lost compass. Adventure! – to justify it being a narrative piece. Nothing it throws into the mix works, however, and it just ends up making everything seem even more boring. Even the pretty visuals of the deserts get tiresome after a while, with an overused birds-eye shot that you’ll want to strangle by the time the credits mercifully pop up. Seriously, the film is just under two hours long but you’ll feel like you’re in the auditorium for four. It wouldn’t be so bad if the main character was strong enough to warrant a feature-length film, and she really isn’t. Points go toward Mia Wasikowska who, to her credit, does seem to be committing greatly to her role, but the character itself is very bland and uninteresting which turns us off even more. We never get to truly know her character, we don’t identify with her personality, and she comes off more as a pretentious recluse – in her own biopic, mind you – rather than an engaging lead. Even her reasons for going on the 1700-mile trek in the first place are frustratingly vague; she just decides “why not?” and sets off as soon as she can. That isn’t enough, guys; there needs to be an emotional reason for going on such a life-changing quest, it’s part of Film 101. Just saying “why not?” does not warrant interest in her character, and if anything it makes us even more annoyed that there’s nothing to her. The film does try to insert emotional connection, but at times even these can be really awkward and forced. At one point, completely out of nowhere, Wasikowska decides she’s spontaneously attracted to Adam Driver’s photographer who had previously done nothing but irritate her by only doing his job. The two actors, no matter how hard they try, do not share any chemistry with each other so the moment really does astound you by how out of leftfield it comes. In addition, she meets various people along the way including an Aboriginal tribe, obnoxious tourists and desperate reporters (honestly, is it really that slow a news day in Australia?) but they all come and go so fast you forget about them the moment they disappear off-screen. In fact, you question what impact they had on the character and story at all other than just random people she happened to encounter on her journey. Maybe all of this really was how it happened in reality, but the thing with film – especially narrative film – is that the experience needs to have dramatic engagement in order to keep the audience’s interest. This is where dramatic license can come in and – dare we say – improve on the story for the sake of the audience. This is why Tracks would have probably been better as a documentary rather than a narrative feature, because if they truly did stick so closely to the facts then what’s the purpose of not making it a journalistic piece? Tracks is not a story that’s well-suited to a narrative feature, with serious pacing issues and a boring lead character making the viewing experience quite a drag that ultimately kills the film and any chances of a re-watch. If it were a documentary, it’d be much different and probably much better too.